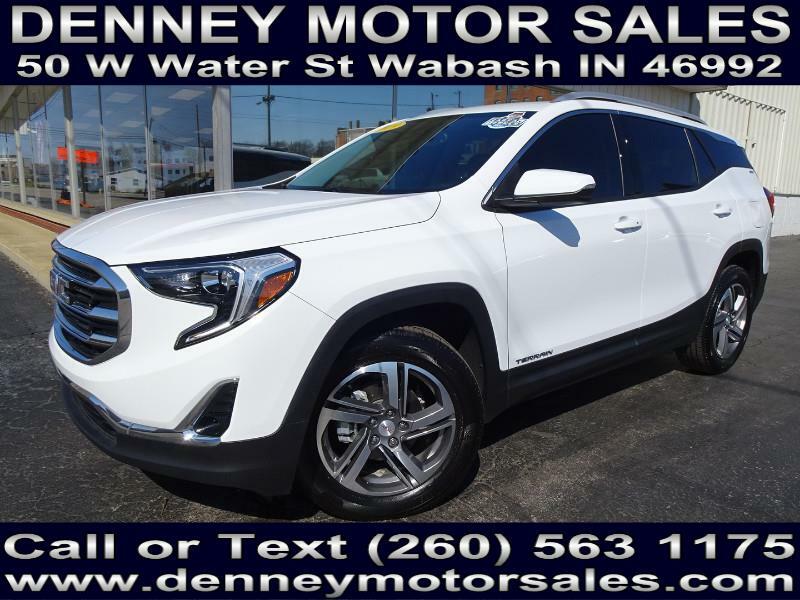 Used 2019 GMC Terrain SLT AWD for Sale in Wabash IN 46992 Denney Motor Sales Inc.
2019 GMC Terrain SLT AWD. 1 Owner, Non Smoker, Clean CarFax, Heated Leather, Navigation, Warranty! Bumper to Bumper Warranty, Non-Smoker, 1 Owner, Clean CarFax, Navigation System, Heated Front Seats, Heated Steering Wheel, All Weather Floor Mats, Bose Premium Stereo, Remote Start, 18 Inch Aluminum Wheels, Power Driver and Passenger Seats, 1.5L Turbo 4CYL Engine, Automatic Transmission, White with Gray Leather Interior, 60,000 Mile Warranty, Keyless Start System, Driver Information Center, Bluetooth, Sirius XM Satellite Radio, and much more! Please visit http://www.denneymotorsales.com/ to view more photos of this 2019 GMC Terrain SLT AWD!! Welcome to http://www.denneymotorsales.com/! There is a sale everyday at Denney Motor Sales! We are located in Wabash Indiana. It is time for you to take advantage of our 80 years of sales, service, and parts experience. We are ready to take care of all your automotive needs. View our entire inventory on http://www.denneymotorsales.com/. Please feel free to complete our secure online credit application on our website and drive your new car or truck home today! Financing is available! Call Randy Denney toll free at 1 800 573 1175. Mike Goff - Happy Repeat Cusotmer! I browse Denney’s inventory on their web site at least once a week. They always have late model high quality clean vehicles but from time to time they have something really unusual and interesting. I was looking for a fun vintage investment type car to just play with on the weekends. They had a low mileage, super clean 2003 Thunderbird and Randy Denney made me a terrific deal. That’s the second vehicle he’s sold me and I will be back.